Finn loves Yo Gabba Gabba, at first I thought it was a little creepy, but I have to admit I kind of like it too. The other day we were playing a game online at Nick Jr.com and I saw a little section called crafts. So, of course, I had to interrupt the game and see what it was all about. 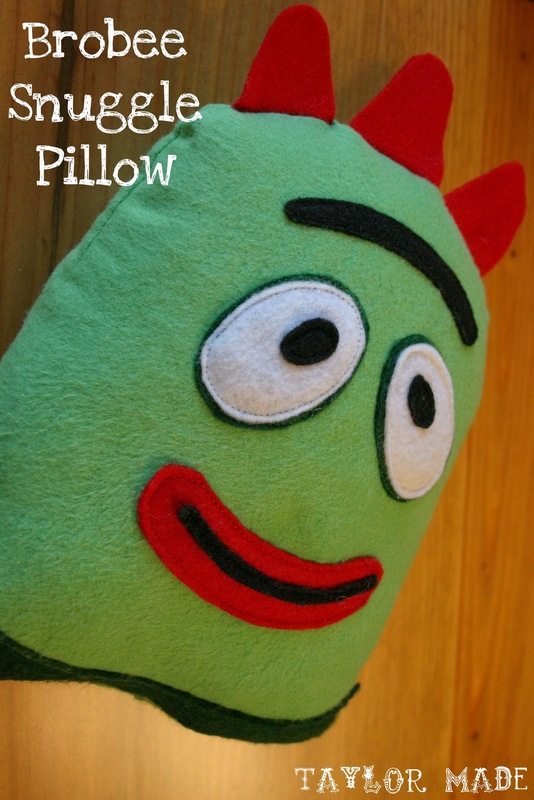 My eye was suddenly drawn to… a Brobee Snuggle Pillow! Are you serious, Finn would love that. The Nick Jr website even has a template for all of the parts of the face and has all of the characters. Brobee is Finn’s favorite so I made him but I might make the others soon. Their version is a “No Sew” version, but sewing it will make it last so much longer. I also used a thin fleece for the back instead of felt so it will be even softer. You can print the template right from the website HERE! Hi Brobee. Finn is going to be so excited… I hope I cant wait until Christmas, only 14 days!